In this poll, we asked dentists: Do you encourage your adult patients to bring their children in for treatment? Well, it’s good news for the children, as the clear majority of dentists are happy to accept pediatric patients. Eighty-six percent of dental practices report that they accept child patients. The remaining 14% prefer to treat patients over age 14. Rural and female dentists were most likely to practice pediatric dentistry. Geographic differences were notable. 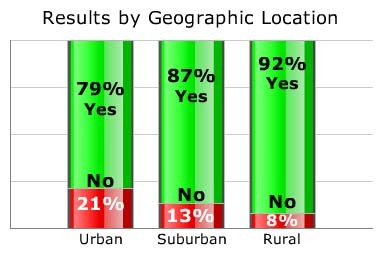 Urban dentists are nearly twice as likely as suburban dentists and three times as likely as rural dentists to refuse to treat children. specialized pediatric dentists than are rural areas. 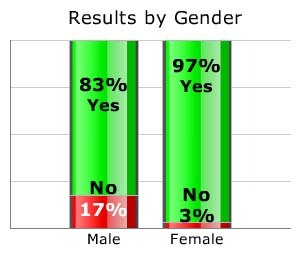 Gender results were also remarkable. There exists a popular notion that female doctors are better with kids than male doctors. 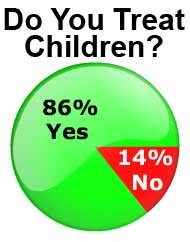 Although that statement is clearly a gross generalization, our survey did find that female dentists were especially likely to treat children. In fact, male dentists were eight times more likely to turn away pediatric patients than their female colleagues. 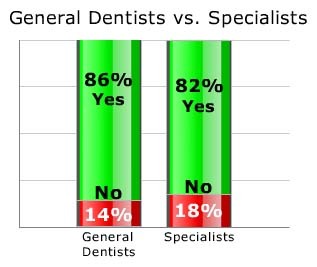 Differences between specialists and general dentists were not significant. A dentist’s specialty is particularly likely to dictate whether he or she accepts patients under age 14. Pediatric dentists and orthodontists treat lots of kids, whereas prosthodontists and endodontists not so much so.